Are you struggling to make money from your website, blog or social network? Our aim is to provide easy to use and manageable tools to affiliates and online publishers that can help you monetise your websites and mobile apps quickly and cost effectively. RevGlue emanated from the creative ideas of two great developers, Adeel Farooq and Muhammad Zahid Sardar. Both of them have partnered on several occasions to provide amazing designs and development services to affiliates spanning over 120 projects all across the globe. This experience of working together in the e-commerce performance marketing industry provides them with a unique insight into the major issues affecting affiliate website owners when they want to monetise their websites. The continuous quest for bloggers and website owners in setting up affiliates links and ads to make money for their sites serves as the underlying idea behind the creation of RevGlue. RevGlue identified the major problems facing bloggers, website or mobile app owners in monetising their start-ups. 1 - Managing the complexity of affiliate content where there is no standard format across different networks for cashback, coupons, group deals or price comparison data. Fixing this requires the affiliate to incur high costs for content management by hiring dedicated data managers. 2 - The inexperience of site owners in identifying and choosing the best affiliate deals for monetising their start-ups. They lack a single admin panel that brings together all of their performance marketing data across affiliate networks and sites. 3 - The resulting wastage associated with spending thousands of pounds in setting up simple affiliate websites such as cashback, coupons or price comparison and enhancing their look and feel which fails to generate the desired Return on Investment (ROI). RevGlue is, therefore, designed to solve the above problems head-on through its array of structured modules that are accessible on a flexible pay as you go basis. Our mission is to help bloggers and affiliate website owners generate desired return on investment from their start-ups within days and weeks rather months and years. As a plus, RevGlue is proudly backed by international investors who are supporting the two founders and 12 employees who are working hard to make RevGlue an essential toolkit for online publishers seeking to monetise their websites. We at RevGlue observed that e-commerce stores normally set up programs on affiliate networks which can be based on Cost Per Acquisition (CPA), Cost Per Click (CPC) or Cost Per Lead (CPL) models. Commission rates vary depending on the value of the website referring a customer to that store. Affiliate networks then provide the promotional inventory (banners, coupons, product feeds etc.) and distribute them to all sorts of online publishers including affiliates. Online publishers collaborate with the affiliate networks to manage thousands of e-commerce stores in the UK. RevGlue works as a glue between the affiliate networks and online publishers. We help site owners such as you with content retrieval and clean up from multiple affiliate networks into a single structured format. We then provide several useful tools for distribution, promotion & monetisation of your websites and mobile apps. RevGlue saves you the high cost of hiring dedicated data managers as our admin panel bridge that gap to provide you with a simple and consistent way to manage your stores and affiliate relationships. This is true if you are an experienced e-commerce publisher who runs existing coupon, cashback or price comparison sites or if you are a first time blogger or content provider looking to generate new revenue from your website. Through our reporting packages, you can see which type of affiliate service or product is providing the best returns on your site, and also those that are not effective; meaning that you can replace ‘low value’ links with higher value options. The outcome is that we help you make more money through your site – with an ROI that far exceeds the low subscription cost that you pay RevGlue each month. At RevGlue, the success and the continuity of your start-ups are of paramount importance to us. We also look forward to having an endless partnership with you – it’s that simple. To get started, use our research tool to find the right affiliate program for a store that you are going to promote. 1 - Affilite Data Sets – data is the core RevGlue module that allows you to obtain structed data sets on UK stores, cashback, coupons, group deals, mobile comparison, broadband comparison, banners and product feeds. You can subscribe to multiple data sets on monthly basis aggregated from all the UK leading affiliate networks which we cleanse, structure and validate. This means we have saved you the stress of integrating with multiple different APIs to obtain all your data; instead, you use a single RevGlue user interface that is structured and updated daily. From an integration perspective, you can fetch or download the data via XML, CSV or JSON. Subscribe to any data set absolutely free for the first 30 days. 2 - WordPress plugins – We have developed plugins for each of our affiliate data sets bearing in mind that majority of the online publishers use WordPress. For example, if you want to setup a coupon website then you can download our WordPress plugin for UK COUPONS and it will fetch the coupons data for you from the RevGlue affiliate data section. Best of all the WordPress plugin is free to use. 3 - WordPress Templates - Our WordPress templates are responsive and compatible with our WordPress plugins. That means you can just buy a site template, drag the files across and then it is all set to go. Add a unique colourful theme today on your affiliate website at only £99 per template. 4 - Stats – All your reporting needs are handled by our statistics module. We obtain sales/conversion data from all the UK affiliate networks and direct merchants and offer it as a monthly subscription via a single API to you. This means that you can quickly view how much you are earning on each network. Try is free for the first 30 days. 5 - All in One Affiliate Packages – This new service launched in November 2018. RevGlue now offers three core all in one packages for affiliates including Bronze, Silver and Gold. The aim of this service is that the RevGlue team will manage all your tech and data project requirements including data, affiliate networks, cms, hosting, domain on a fixed yearly subscription basis. So you can concentrate on what affiliates are supposed to do that is driving relevant users to your affiliate websites and earning the highest commissions. RevGlue makes sure your affiliate website is up and running all the time with latest the contents updated on daily basis. 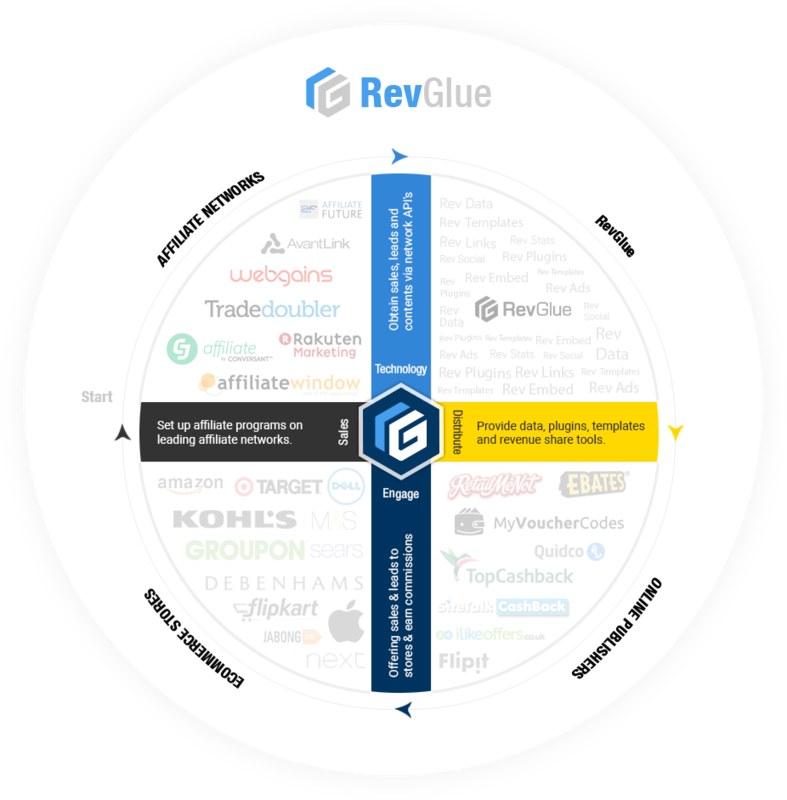 RevGlue is your reliable tech partner offering coupons, daily deals, mobile comparison, broadband comparison, product feeds and cashback websites in all in one affiliate packages. Alternatively, if you are an online publisher or blogger who is new to the world of affiliate marketing, then we offer the following four revenue share modules. 1 - RevSocial – This is a free CPA module that allows you to earn 80% of all sales referred by you, and the RevGlue share is 20%. For example, let’s say your friend on Facebook is seeking where to buy Nike shoes, the latest game or a cheap laptop, you can quickly search for a laptop on this module and share the link with your friend via social media or direct link. Once they buy the product, you will get the commission. Our system can also recommend top offers; latest products and users can set alerts for new products coming into the market. We also have Android and iOS apps for this module so you can quickly recommend a deal or offer to your friends and family. Try searching from the goldmine of thirty million products, coupons, deals, mobile deals and discounted offers. 3 - RevAds– This free CPA module which allows bloggers, website owners, mobile application developers and affiliates to create links, product or banner ads. Users can specify which ad type they require, set sizes, choose styling options and content and decide for the stores that they wish to link to. This module is one where you earn 80% of all sales referred by you, and the RevGlue share is 20%. 4 - RevEmbed - This free CPA module for website owners allows you to add an extra revenue stream to your websites and domains. If for example you have a news website that gets quality traffic then you can install RevEmbed coupons and daily deals, cashback, product feeds, mobile comparison, broadband and tv iframes as a panel such as www.mywebsite.com/coupons/ inside your site with just a single line of code. You are not required to register with affiliate networks or hire data managers or a technical team to manage your RevEmbed website. Once installed you will be earning 80% commissions on all the sales. RevGlue also offers bespoke solutions to affiliates. If you wish to hire RevGlue design, development and data team for your dedicated project then RevGlue can support your worldwide affiliate project in multiple currencies, languages and countries. RevGlue acts as your design and development agency for all bespoke solutions that you own and host it on your servers. We can design and develop professional affiliate websites, mobile applications and browser extensions for you within weeks. RevGlue went live in the UK from 1st January 2018. We will prove our proposition in the UK in 2019 and then we plan to provide our services in the USA from early 2020. If you are interested in investing in us to support our growth and plans, then email your interests to adeel@revglue.com. Thank you for reading our story. We look forward to helping you become a more successful entrepreneur.